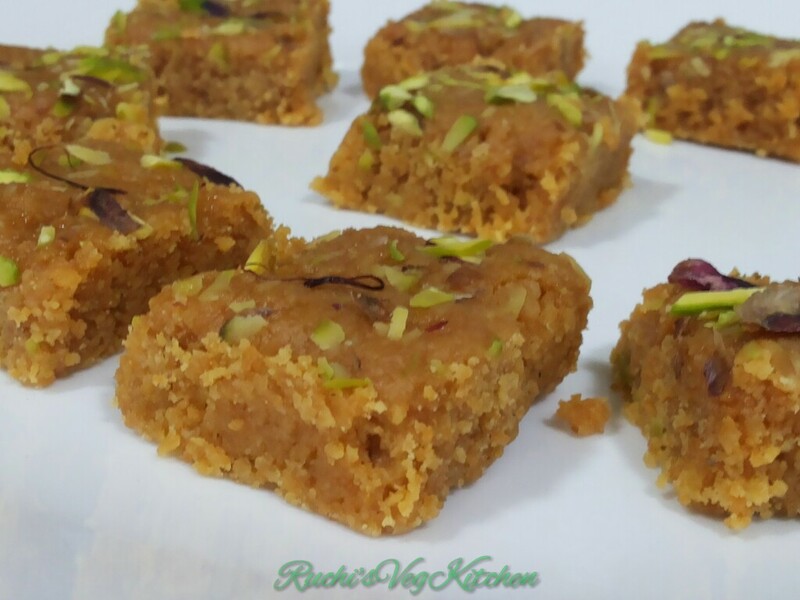 MohanThal / Gram Flour Fudge / Besan Barfi is traditional Gujarati and Rajasthani Sweet which is flavoured with Saffron and Nuts. It tastes Delicious, soft, sweet and yum yum.. 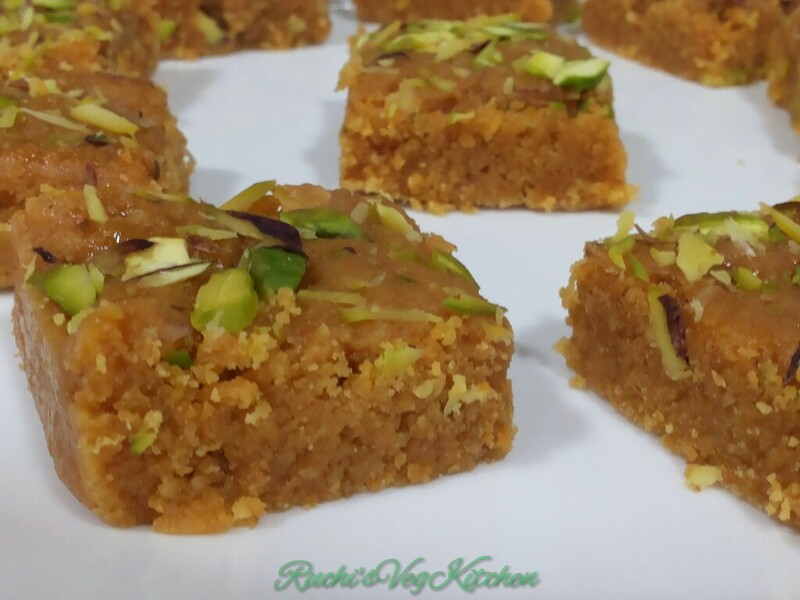 Perfect Sweet for Diwali or festival season. Well i dont think this sweet any more introduction. Here , i will share a never fail Recipe of my Mom. 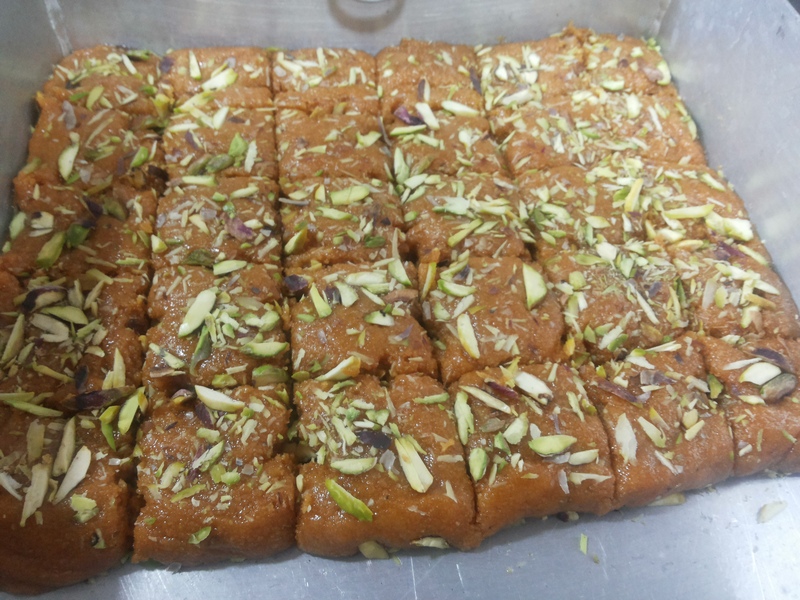 To make this delicious sweet is bit tricky.. Exact proportion is exact timing means a lot for this recipe. I will try to explain each step with pic. Hope you all will love it. 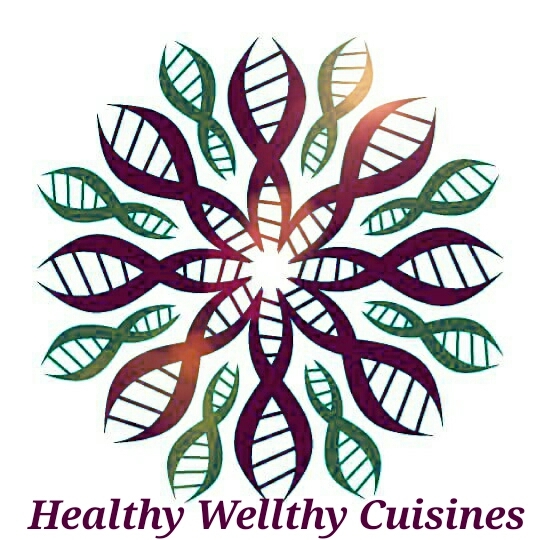 We have to use Coarse Gram Flour not the fine flour. 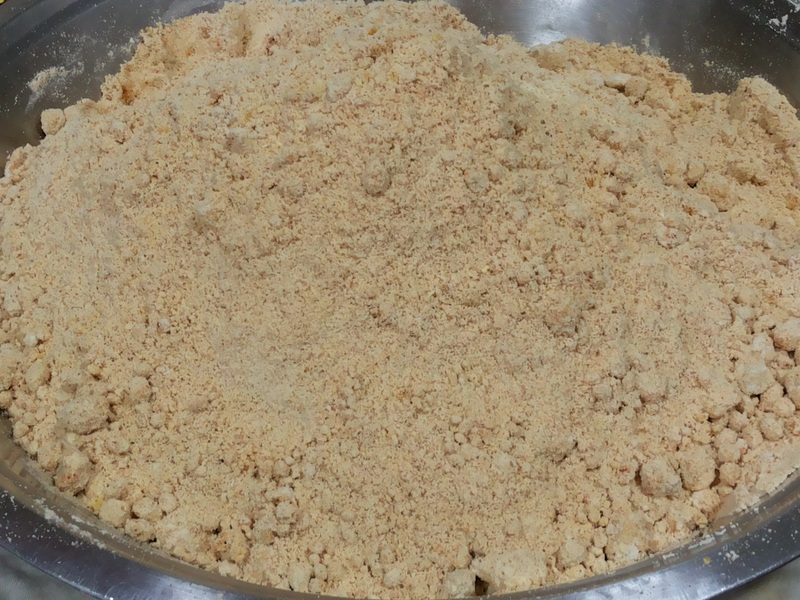 Take coarse flour in a bowl. 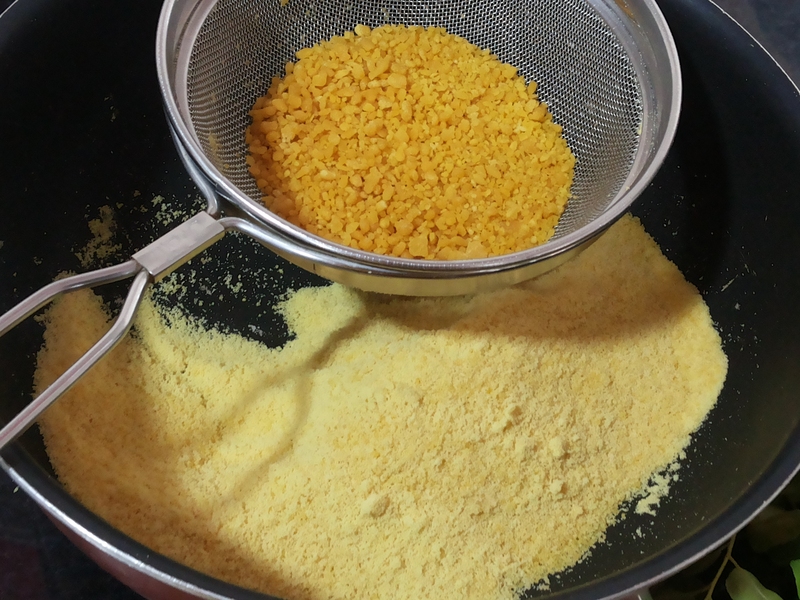 Add 3 tsp warm milk and 3 tsp warm ghee to it. Mix gently. dont rub. Cover the lid and allow it to rest for at least 2 hrs. After that time rub with hands nicely, sieve again with slightly big hole seiver. Press with your finger tips and sieve properly. With this step flour will be even and without any lumps. On other side take sugar and 1 cup water. Flame should be slow till it starts boiling. Make 1 thread Consistency on medium flame. Add saffron strands, cardamom powder and pinch of food color. 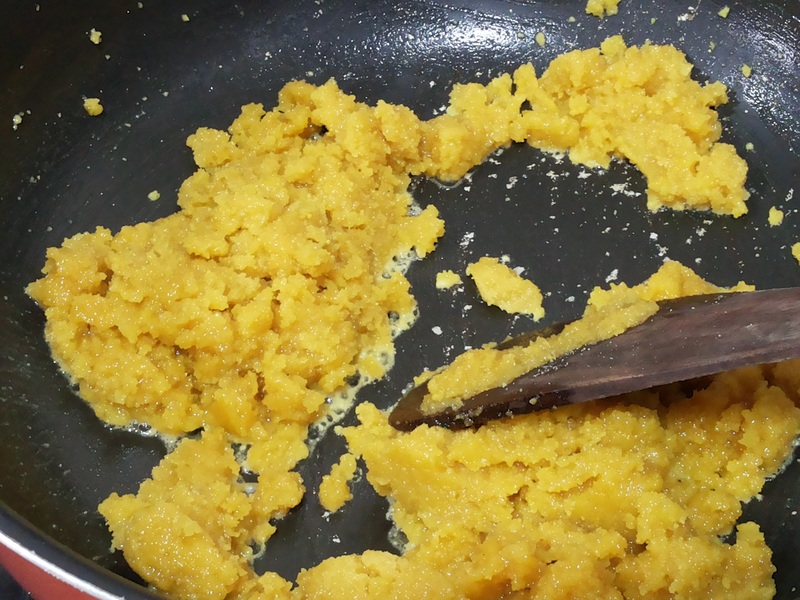 On a heavy bottom non stick pan take sieve flour and ghee. 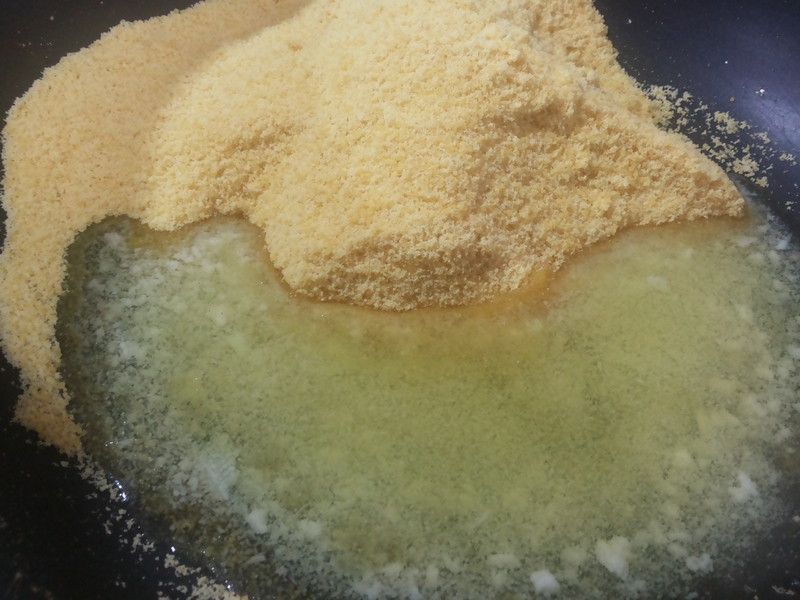 Roast ghee and flour on slow flame till golden brown color. 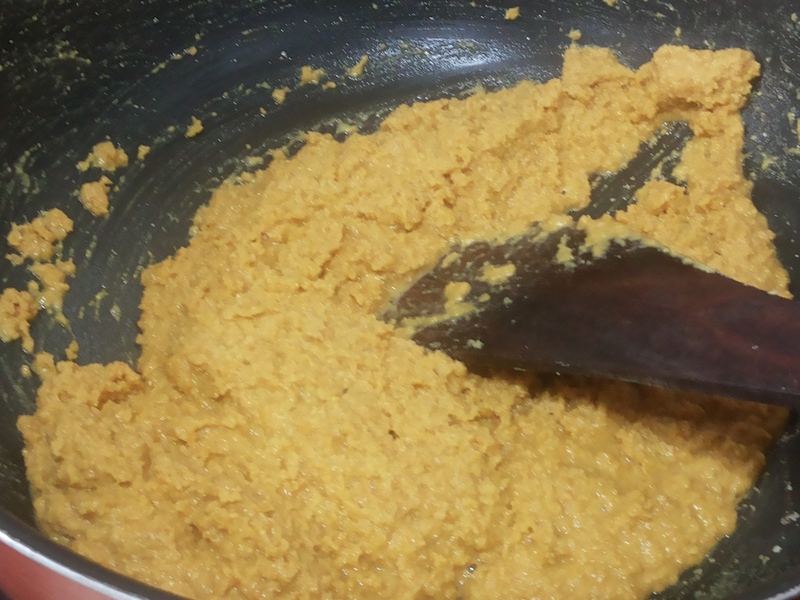 keep stirring else flour will burn or stick at bottom.. As flour get roast , mixture will be light and fluffy. 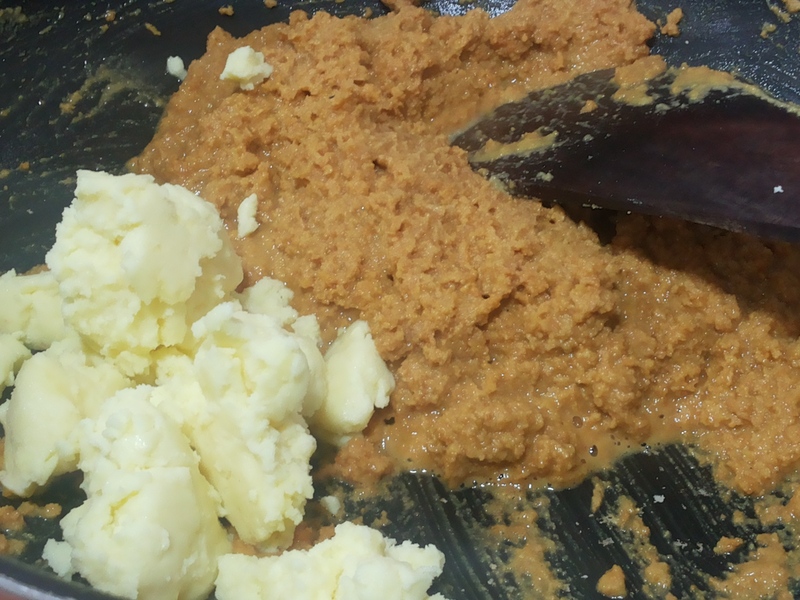 Now add MAVA and mix properly. 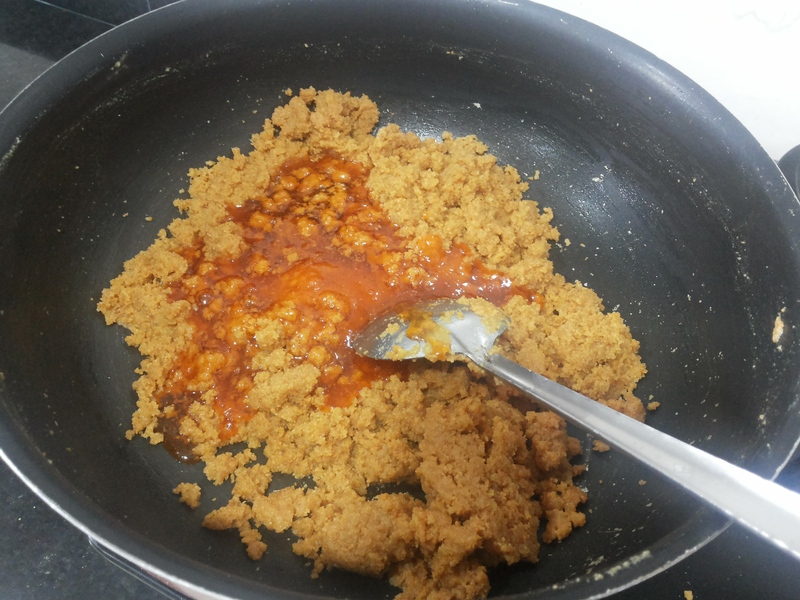 mixture should be without any lumps. For whole this recipe the gas flame will be slow only. Now add Sugar syrup and switch off the gas. Give a nice stir with speed for a minute. 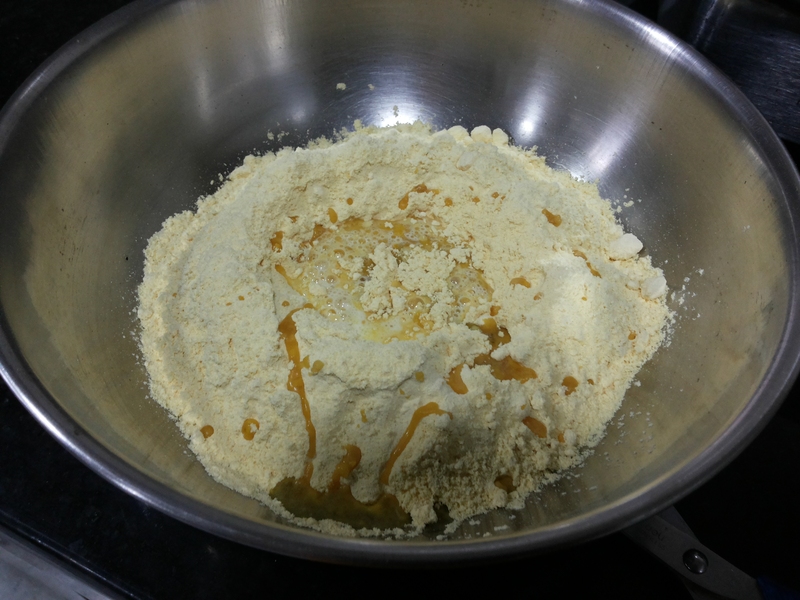 Now pour this mixture on a greased pan. The thickness of sweet can be decided by you. If you want more thick , take small pan. Garnish with Pistachio slivers. Allow it to cool for sometime. Cut in square shape. Allow this sweet to cool and set for at least 6-7 hrs. Store in air tight container . Keep in freeze for long shell life. 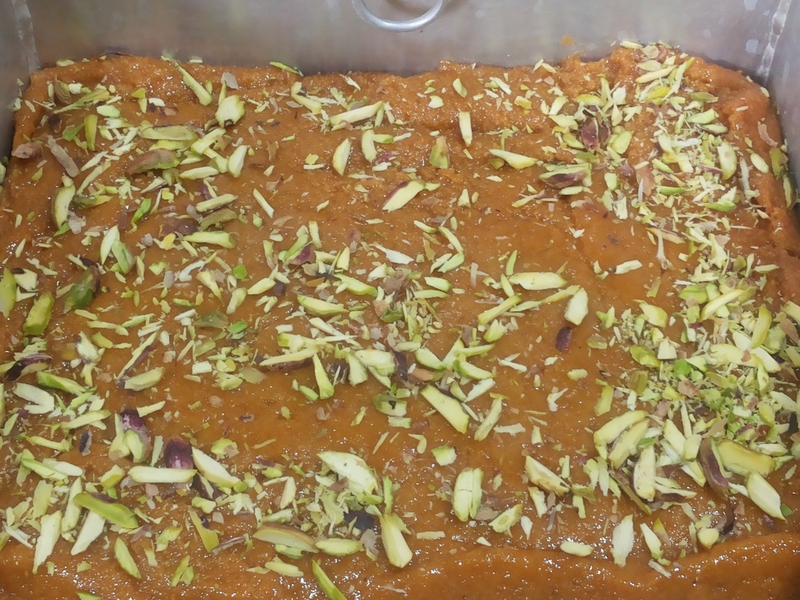 Hope all will love it..
Kesar Mohanthal looks so delectable..perfect festive treat ! !